BRRR!! When on earth did it get so cold? The NYC wind chill is really biting my nose off and giving my immune system the test of a life time. Well, before I wrap up every inch of my skin from the fighting Sun, I decided to give my culottes a breathing chance one last time. 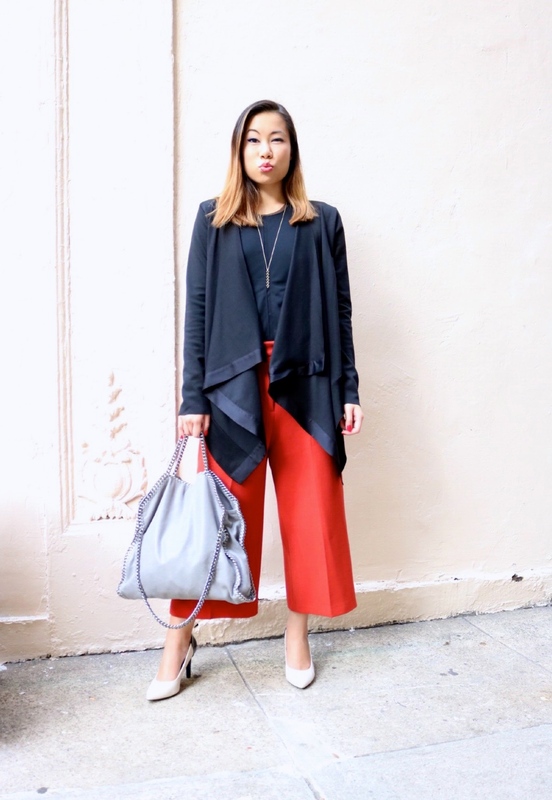 Astounding with its brick color, this culotte is one of my favorite pieces of clothing that I own. Trend-right with a great fit and beautiful color, there are no complaints. 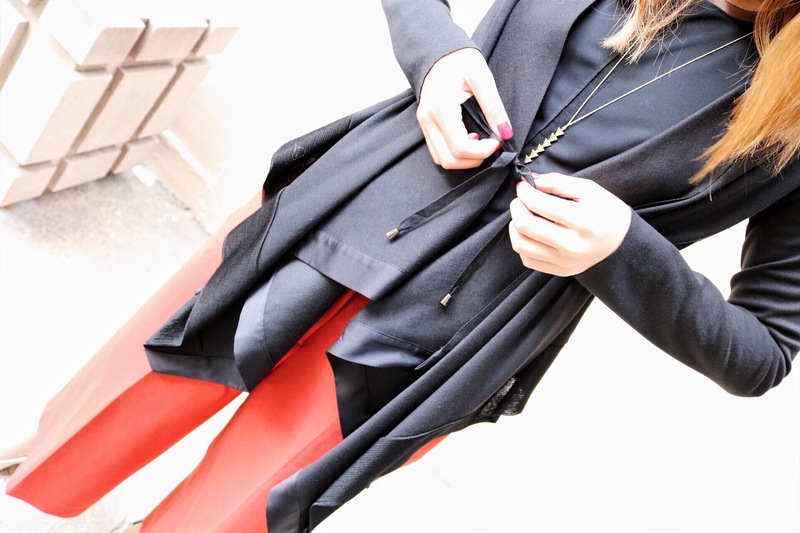 I paired my culotte with a simple black blouse and topped it with a drapped cardigan made of different textures. It also had a cool string to tie it all together to give it an elegant and more fitted look. Necklace: Ascension Pendant Necklace by House of Harlow from Rocksbox – get your first month free with the code “THESTYLEWRIGHTXOXO” and get this necklace and many other pieces of fashion jewelry curated just for you by your own personal stylist! And this is one of my favorite bags of all time. The Stella McCartney falabella bag. It has finally made its debut on my blog! Also, these shoes. 5 stars for comfort and classy style. Shoes: Strike a Chord Pointy Pump, Off White/Black – sold out now! And this is me being a silly goose, because well sometimes in life you gotta be a silly goose…and own it. Thanks so much Material Wrld for the invitation to your VIP Fashion Launch Party with Steven Alan! I had the opportunity to meet wonderful entrepreneurs of the fashion world: Rie and Jie, cofounders of MaterialWrld; Steven Alan of Steven Alan; Connie Wang, Fashion Features Director of Refinery 29; Chelsea Leyland (DJ, Model, Actress, Fashion Commentator); and Jenné Lombardo, Mastermind behind Milk Studio and Co-Founder of MADE Fashion Week. All beautiful and inspiration people. In love with that cardigan OMG! Really nice outfit! Perfect! Love this! The culottes look amazing with that jacket.